What is this that's forming? Is this a normal process for thrusters on spacecraft, or is it related to this being an upper stage that doesn't have much of a use beyond getting the payload to orbit - I would expect thrusters used in the longer term to not do this (especially since presumably anything that forms is not contributing to the actual thrust, reducing overally efficiency). What makes this different? Currently you can see the camera on Stage 2, looking at the upper stage engine, that white object you see is solid oxygen, very fluffy, lighter than a snow ball. That is normal at this stage of the flight. When this was captured, it was at the end of the rocket flight. Looking carefully at this, I don't see any other similar nozzles. Furthermore, I didn't see any evidence of this being used in flight. I'm going to assume from all of this that it must be the vent value for the LOX, which was mentioned in the video recording immediately before. What happens with such a release is that the temperature tends to drop when a compressed gas is released. Being in a vacuum, the material cannot be atmospheric, such as ice, but must be a frozen variety of whatever is being leaked. We know that the LOX tank is the lower of the two tanks. A phase diagram indicates that LOX would be solid if the temperature is around 80K, which is entirely possible. That LOX was vented before the final burn to chill in the engine. The final burn happens after payload separation to park Stage 2 away from the satellite. Not the answer you're looking for? Browse other questions tagged rockets spacex falcon-9 upper-stage thermal or ask your own question. What is the icy formation on these rockets? 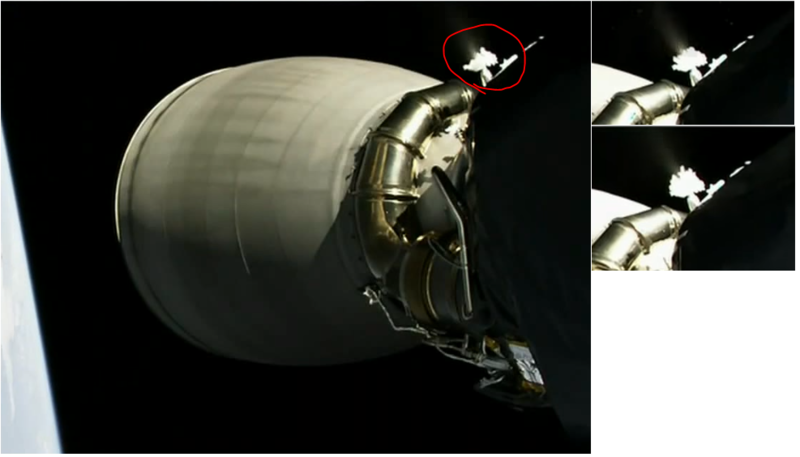 What is this jet of material spraying out from Stage 2 during the SPACE-X PAZ mission? When this F9 2nd stage engine suddenly moves upon shutdown, is it moving along the rocket's axis? What was all of the junk in the SES satellite deployment? Why did SpaceX choose gas thrusters over reaction wheels/CMGs? 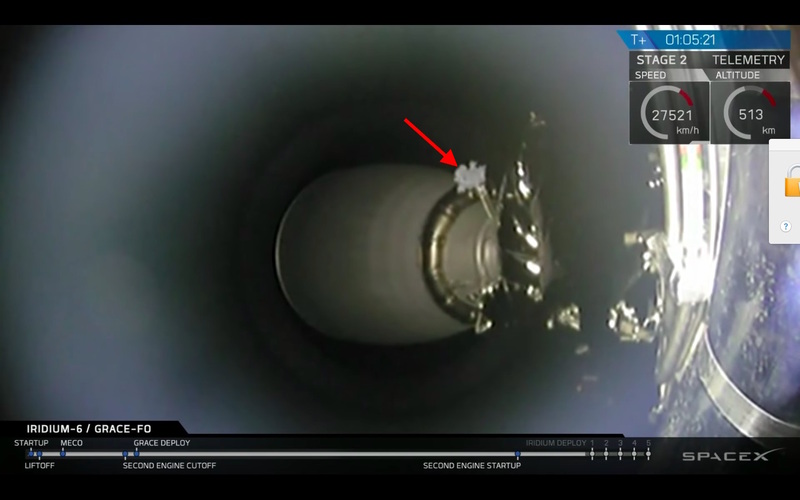 Why rotate the Falcon 9 2nd stage after deployment? Problems compressing the helium tanks inside the F9 2nd stage LOX tank at the last minute? How many kilo's of nitrogen does Falcon 9 load for its first stage cold gas thrusters? Why are exhaust flames “jumping around” the bases of the Falcon-9 engine nozzles; NROL-76? Was SpaceX's launch of Formosat-5 more vertical than normal for any particular reason?